In order for this plugin to work, we need to have a Twilio phone number. The only requirement for this number is that is supports SMS messages. You can select to use a local number or a mobile number, it’s up to you. Your Twilio number needs to have SMS support in order to work with this plugin. 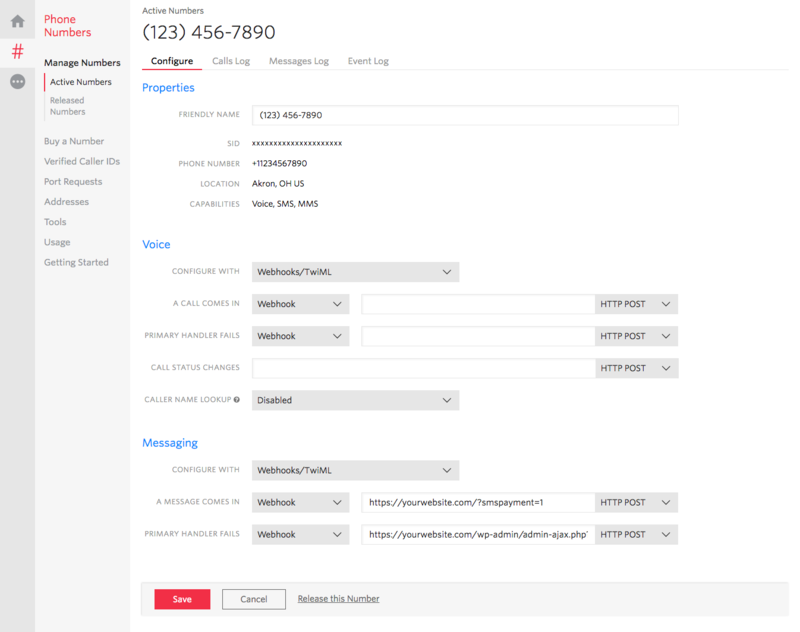 In our Twilio account, click on “Phone Numbers” to see your list of active phone numbers. Select the number you want to use and click on the number in the list to configure it. The part we are interested in is the “Messaging” settings. Here we need to select “Webhooks/TwiML” and enter two Webhook URLs. These URLs can be found on your myCRED Settings page under “Twilio Transfers”. Make sure the URLs are pasted in exactly without any extra / accidental empty spaces. Make sure to select “HTTP POST” in the dropdown menu for both URLs. Remember to save. All other settings on this page are irrelevant for this plugin and can be set to anything.